As one of the most picturesque hunting lodges in Missouri, we are proud to offer a premier location for waterfowl hunting enthusiasts. Located near both a horseshoe lake and another that is man-made, several kinds of birds, including turkey and geese, provide rich hunting grounds for our guests. When you’re here, you’re family, and we treat you to warm accommodations and family style meals that you won’t experience anywhere else. If you’re planning a waterfowl hunting trip in Missouri, be sure you come prepared for a good time and excellent hunting as we show you why Lost Quarter Farms hunting lodge was voted the best in the Midwest. We can make your trip as easy or as challenging as you like, as we offer fully guided trips for our new hunters and self-guided trips for intermediate to expert level hunters. We recommend using our guided trip for your first waterfowl hunting excursion so you can get the lay or the land and get a feel for what we expect of our hunters here at Lost Quarter Farms. Here at Lost Quarter Farms, we experience everyone’s success when they come back to the lodge bearing the successes of the day. To make our guests stay a little more comfortable, we do offer to clean and pack your birds so all you have to worry about is meeting your limit and having a great time. Mendon is proud to call Lost Quarter Farms their claim to fame as we welcome visitors from all over the world into our lodge. Though the weather can be cold, the hearths are always warm after a day of wading and baiting, so make your reservation now to experience the proud tradition that is Lost Quarter Farms. 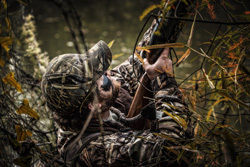 Contact us to share your waterfowl season with us.